● A common misconception is that Muslim women are the only ones who cover their hair. It may be true that Islam is the only religion in which most women follow its directives to cover the hair, but it is not the only religion to have such directives. 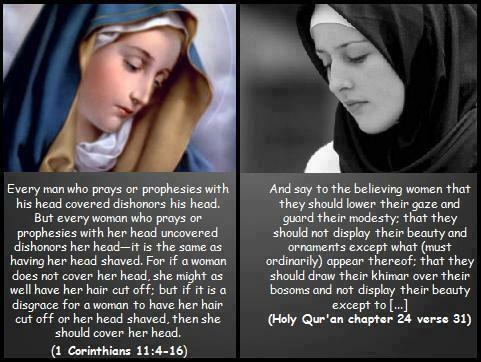 ● Is covering hair a religious obligatory commandment for the Christian Women? Answer is simply Yes! we see her picture in the Christian churches and everywhere. How is she dressed? she was fully covered from head to toe except for the face and hands! ‘And Rebecca lifted up her eyes, and when she saw Isaac, she alighted from the camel, and said to the servant, “Who is the man yonder, coming to meet us?” The servant said, “It is my Master”. So she took her veil and covered herself’. and say, ‘This is what the Sovereign LORD says: Woe to the women who sew magic charms on all their wrists and make veils of various lengths for their heads in order to ensnare people. Will you ensnare the lives of my people but preserve your own? I think in the past, Western/Christian women used to dress more modestly; and they covered their hair at least when they wanted to go to church. But the problem is: Western norms are changing all the time. And they expect us (and all other cultures) to follow what they are doing at this very moment…The fashion of the day!